In a world that burns with the constant desire to anoint the next big thing, Americana singer-songwriter Kylie Rae Harris isn’t a firecracker, destined to erupt and flame out. Rather she’s an unflagging spark, building momentum as she blazes through each song she touches. Blessed with a bluesy tone and bold spirit, Harris pens frank songs about the human heart, chronicling its wants and foibles with equal fervor. 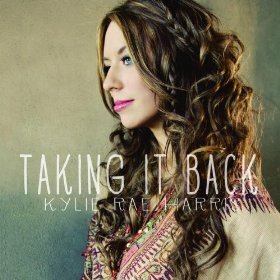 Alongside co-writer and producer Wayne Kirkpatrick, the native Texan continues her steady musical climb with Taking It Back, an excellent EP that melds country, blues, and rock and will hopefully ignite a new wave of recognition for Harris’ talents. Harris’ perseverance in the face of a professional and personal grind is channeled into the assertive nature of Taking It Back. Even at her most vulnerable, she displays underpinnings of strength; the EP title comes from bittersweet opening track “Waited” when Harris bitingly announces to a neglectful significant other “This is my life/I’m taking it back.” Listeners will undoubtedly hear traces of Bonnie Raitt, one of Harris’ musical heroes, in the nuanced number, as Harris’ artful phrasing conveys painful regret that segues into eventual triumph. Similarly, on the plainspoken “Revelation” her naivete melts away in the wake of a beau’s cheating. Struck by the enormity of his disregard, Harris’ initial shock gives way to grudging gratitude. “I don’t love you and I don’t have to,” she realizes, tentatively at first, but she resolutely affirms the sentiment at the song’s conclusion. Eventually, her voice crescendos into a fierce wail, a potent cry of warning before overlapping echoes of “Thank you for the revelation” rain down on the unfortunate ex’s head. Than to hold on to something that just don’t exist. Belting with assurance, Harris aims each word straight at unsuspecting hearts. After only six songs, those listening to Taking It Back will be left wanting more. Perhaps that’s all part of the plan. Instead of following trends, Harris has purposefully nurtured her career, presenting glimmers of her best material. May her own flame continue to burn bright. Visit the Official site, Facebook, and YouTube page.